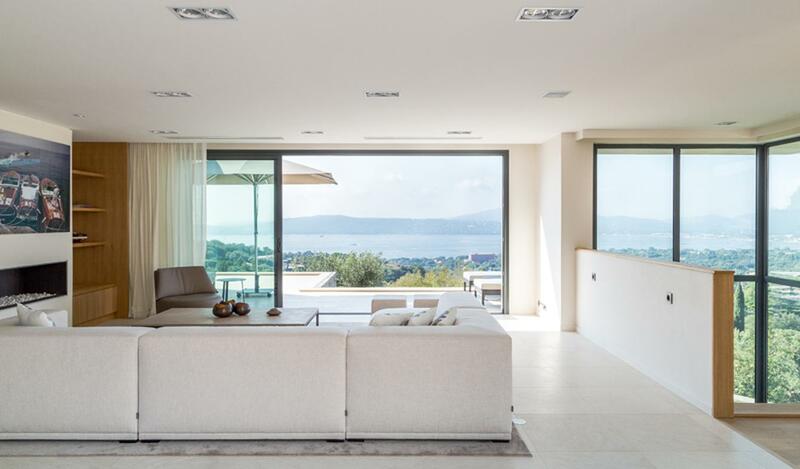 Nestling on a lovely landscaped ground, overlooking the Gulf of Saint-Tropez, this splendid property offers huge living area over two floors, builted in a original cubic design. With its panoramic views, 5 spacious bedrooms and a high quality interior décor, the property is perfect to find your bearing the first day of your stay. Furniture and fittings combine modern convenience with contemporary elegance, and from your heated mirror pool, or the numerous shady terraces overlooking the Gulf of St Tropez, you will feel perfectly relaxed. Built on two levels into a hillside with beautiful views, every floor, and almost every bedroom has direct access to the terraces outside, creating a sense of openness and making this villa a perfect choice for families or groups of friends who prefer to be independent. Nonetheless, the superb open-plan kitchen, living and dining area provide ample space for sociable evenings, family gatherings and movie shows.If you want to discover or re discover French Riviera, this property is a must to allow you to spend holidays full of dreams, delicacies, sun and conviviality.